This is an exciting time to contemplate a bigger future in space. That may seem a ludicrous proposition given the thesis of the previous section which was that Americans are ambivalent about funding space exploration, have been since Apollo, and any proposal for a more expansive space program must overcome a daunting list of challenges. Given their importance, those challenges are worth recapping. The forecasts of our long range fiscal situation are grim. Our national debt is enormous and likely to get worse. Our middle class is under threat and our economy may be entering a period of secular stagnation where income inequality may yet worsen from already historically high levels. Every region of the world seems to be getting more dangerous, requiring more guns over butter. We face a warming planet that is likely to impose significant costs in the future. These issues are occurring against the backdrop of a polarized and seemingly poisonous partisan political environment. We are a divided nation that seems unable to reach consensus on anything, choosing conflict instead. The list of calls on our resources both now and in the future is long, urgent, and morally compelling, a list in which high-minded aspiration is easily trumped by practical necessity. And yet, the game is changing and this is an exciting time to consider our future in space. Two fundamental game changers have appeared on the playing field that may rewrite the assumptions about what is possible when we think about our future in space over the next several decades along with the balance between the public and private sectors. It comes down to rockets and rocks. We’ll discuss both and then we’ll talk about what the game of getting to scale in space really is and looks like. As argued earlier, getting into space is expensive and always has been. Yet, new rockets representing new capabilities are emerging and they fundamentally rewrite the rules of the possible. The private sector, led by companies like SpaceX and Blue Origin, are closing in on a reusable launcher (the Falcon 9 and Falcon Heavy for SpaceX, the New Shephard and New Glenn by Blue Origin) and NASA is inching closer to completing the Space Launch System (SLS) heavy lift rocket. These are significant developments. To understand why these developments are important, you need to start with the historical record of what it costs to launch material into space. 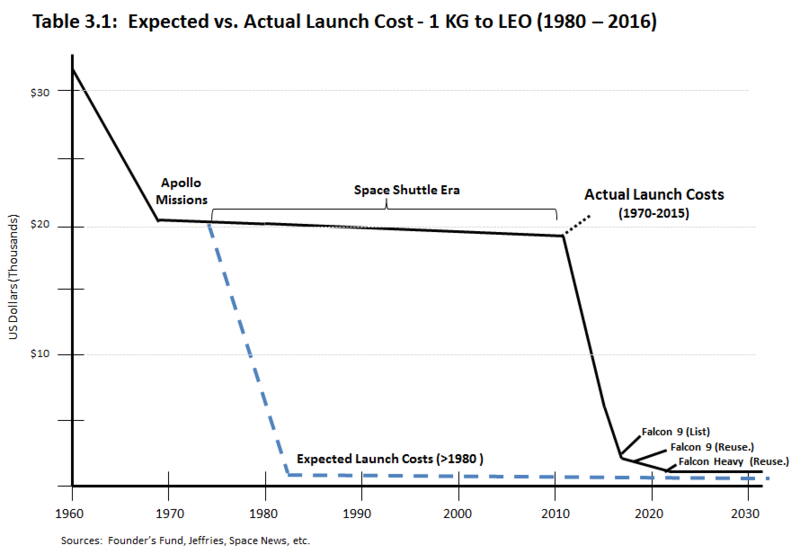 In Table 3.1 below, an illustrative cost curve shows the actual historical cost of launching a kilogram into space to Low Earth Orbit compared to the original premise and forecast made for the Space Shuttle. The Shuttle was supposed to give us the dashed line that was going to bring launch costs to Low Earth Orbit down under $250 per kilogram by the 1980s. In the 1970s, with the Shuttle under development and optimism high for a breakthrough reduction in launch costs, big dreams were considered and discussed. As we know now, none of it happened. With the Shuttle, costs remained in the range of more than $20,000/kg and so the budget realities of doing anything at scale were simply too expensive to contemplate. The momentum for and dreams about a big future in space that had blossomed in the 1970s slowly faded from mainstream sight. The arrival of innovative new firms (SpaceX, etc.) on the scene in the last decade are now bringing launch costs down dramatically and account for the steep decline at the far right of Table 3.1. While Table 3.1 is illustrative, the key point here is that actual costs are beginning to converge with the original premise of the 1970s. Ideas once seriously discussed and considered in the 1970s, when the Shuttle was going to dramatically reduce launch costs and then seemed outlandish for decades because those costs remained so high, may no longer be quite so outlandish. It may be possible to put them back on the table for public discussion. But first, let’s review how and why the Shuttle fell short and what these new innovations are and what they mean for launch costs. The Space Shuttle was a technological marvel and a source of national pride. Designed and built in the 1970s and launched in 1981, the fleet of five production shuttles had a 30-year run as the mainstay of America’s space program with a cumulative total of 135 launches. It was also so complex and expensive that the cost of the Shuttle program crowded out all other human exploration missions beyond Low Earth Orbit and its sheer complexity and design flaws led to the loss of two shuttles (Challenger, Columbia) and their crews. The Shuttle also failed to meet the primary goal of achieving low cost access to space at scale. This latter point is crucial. While the Space Shuttle was originally envisioned as being able to reduce the cost of getting to Low Earth Orbit to a few hundred dollars per pound, (Example: $118/lb in 1973 dollar terms or $650-$750 in 2013 terms, Wikipedia) the truth is the vehicle turned out far more complex than envisioned. The Shuttle was so complicated it required a massive and time-consuming effort to prepare it for re-launch. It required thousands of hours to refurbish both the shuttle and its booster engines in between each flight, an effort done by a small army of engineers and technicians. The workforce supporting the Shuttle program was nearly 25,000 strong, making the labor bill very expensive. Its main engines had to be completely removed, disassembled, and refurbished. Its 35,000 individual heat shield tiles had to be each manually inspected to confirm they were undamaged and remained in place. The fastest turnaround time from landing to re-launch given this near total refurbishment was reportedly two months. In addition, the shuttle fleet never achieved the operational tempo necessary to drive down costs with volume. Instead of a launch every few weeks, the quickest tempo reached just nine launches in a single year (for a fleet of less than six Shuttles) and more often was much less throughout the life of the program. This meant that the standing cost of the infrastructure and workforce could not be amortized through greater volume and frequency of launches. Given these challenges, the cost of each flight was estimated by NASA as $450 million, implying a cost per lb. to Low Earth Orbit of roughly $8,000 ($18,000/kg). Yet, when all of the development and support costs are added in, the cost per flight calculated by a number of third parties estimates each launch was closer to $1.5 billion, or $27,000/lb to LEO ($60,000/kg). The Space Shuttle was only technically re-usable. It flunked the real test with dramatic consequences for cost. The real test of reusability is often described as more akin to a 737. Can you fly it, land it, and take off again with a very short turnaround window. Think Southwest Airlines. But if you had to take apart a 737 plane after each flight, inspect and polish every part, and reassemble it, we would have today precisely five of them flying around the United States with flights only every few months and not the hundreds of aircraft completing several thousand flights a day, moving millions a year. Gaining access to space has faced this fundamental conundrum when it comes to cost. We either discard the rocket completely or we have to rebuild it from scratch. The 737 analogy (e.g. that launching into space is expensive because we effectively have to build a 737 and then throw it away after each flight) is only partly accurate. A better description would point out that most of what that notional 737 carries would be fuel with passengers and cargo limited to just what you can stuff into the pilot’s cabin. Getting into space has been enormously expensive with very little chance of getting to scale. That is why the milestones on the near term horizon are so important. We’ll start with SpaceX which has generated enormous enthusiasm and hype for its breakthrough Falcon 9 rocket and Blue Origin which was the first to hit the milestone of landing a rocket back on the ground after reaching space. SpaceX, founded by Elon Musk, has been working to break the cost curve since it was founded in 2002. Supported by NASA re-supply contracts for the International Space Station, the company has been steadily innovating and bringing down launch costs and has made enormous strides in a short time on a (relatively speaking for aerospace) shoe-string budget. Whereas the Space Shuttle used to cost $8,000 for every pound of material lifted into Low Earth Orbit (using the more generous NASA marginal cost estimate), the Falcon 9 at current list prices can deliver a pound of cargo to Low Earth Orbit for $2,110. The Falcon 9 can carry up to 14.5 tons to Low Earth Orbit or 5.3 tons to Geosynchronous Transfer Orbit. SpaceX is also working on a heavy lift rocket call the Falcon Heavy which will be designed to lift nearly 58.5 tons to Low Earth Orbit at a list cost of $90m, or slightly less than $770 per pound. The Falcon Heavy gets cost down close to what was originally envisioned for the space shuttle. But that’s not all. SpaceX is also working to make its rockets re-usable. Its Falcon 9 rocket has extendable legs and can return to the launching pad. The rocket initially lifts off and carries its cargo up until the second stage separates. Then, instead of falling back to earth and burning up in the atmosphere or falling into the sea downrange the way every other rocket works today, the first stage uses its remaining fuel and a set of extendable fins to guide itself back down in a controlled landing onto a test platform where it is meant to land on its extendable legs. If each stage of the rocket can be refueled and re-launched in short order, then we have hit the breakthrough milestone of true reusability. We will have achieved the equivalent of the 737. And that would mean a revolutionary drop in launch costs. Just how low costs can go will depend on how successful the re-use and turnaround time really is, but percentages like 50% lower cost or more have been bandied about. After all, commentators continually point out that the Stage 1 rocket costs $60 million to build, but only $200,000 to fuel. If SpaceX can get its rockets to fly again with minimal cost or refurbishment, then it is possible that costs can come down dramatically. If the same reusable landing technology can be applied to the Falcon Heavy and can serve to decrease the cost by 75%, which seems at least possible, then the cost of launching a ton of material into Low Earth Orbit could well drop below $200 per pound. This would completely change the game when it comes to access to space. There are caveats to this story, of course. The technology for the Falcon Heavy involves a more complicated rocket made up of three ‘main’ rockets, each comprised of a cluster of nine engines. It has been suggested that this greater complexity may create its own challenges. The road may not be perfectly smooth for the Falcon Heavy, yet, long-term there are grounds for optimism that this rocket will be developed and deployed and that launch costs will decrease dramatically. As if to validate the skeptics, a Falcon 9 rocket on a supply mission at the end of June, 2015, exploded shortly after launch and SpaceX’s program was grounded while the cause was being investigated. The cause was subsequently identified as a simple part failure and the race was on to return the Falcon to flight. Meanwhile, another start-up in the field was about to surprise everyone. Blue Origin is a company owned by Amazon founder Jeff Bezos and is another private sector contender to create a fully re-usable Vertical Takeoff, Vertical Landing (VTVL) vehicle. Its rocket, the New Shephard, is designed to carry six tourists into space to experience weightlessness and a view of Earth through large windows. Both the capsule and the booster rocket are intended to return safely to be re-used for future flights. The firm was notorious for being secretive about its progress, but suddenly on November 24, 2015, Blue Origin achieved a major milestone by launching a New Shephard rocket to an altitude of 307,000 feet (at the Kamen Line which defines the very edge of space) – and returning it. The booster rocket returned to land back at the launching pad, settling gracefully down onto its four extendable legs at a speed of less than 5 mph. This was the first time anyone had been able to do this and the feat was captured on video and widely circulated on the internet. Blue Origin’s rocket and its engines are being scaled up to a fully orbital size rocket and there may be challenges in getting there, but what is clear is that Blue Origin is a serious contender, along with Space X, to achieve a truly reusable VTVL rocket. What happened in the weeks and months following Blue Origin’s successful milestone flight was the inauguration of what is clearly a new Space Race to reusability complete with dueling rivals. First, SpaceX returned the Falcon to flight with gusto. Just four weeks later, on December 22, 2015, a SpaceX Falcon 9 launched from Cape Canaveral with payload bound for space. At an altitude of 124 miles, the first stage of the rocket separated from its cargo, executed a series of maneuvers to turn around, and then returned to Earth – in a non-standard way for big rockets. The Falcon rocket landed back at its launching pad in Cape Canaveral. This flight was even more impressive because the Falcon 9 rocket is much bigger than Blue Origin’s New Shephard. The Falcon 9 generates 1.3 million pounds of thrust and lifts actual cargo to orbit. The New Shephard generates just 110,000 pounds of thrust and can only reach the edge of space. It’s a test rocket. The Falcon 9 is a much taller and bigger rocket. It’s a production rocket and the flight it completed was far more complicated as well. It was carrying actual cargo (satellites bound for orbit) which it delivered successfully before returning to Earth. In the race to reusability this was huge milestone. A few months later on January 22, 2016, Blue Origin used the same New Shephard rocket to repeat its feat of a flight to the edge of space and then successfully return the rocket to its launching pad. That marked another major first in rocketry: The first time that a rocket has been successfully reused for two flights. Regardless of whether it was a sub-orbital or orbital flight, it was a significant accomplishment. On April 2, 2016, Blue Origin did it again by launching its New Shephard rocket for a third time and successfully landed it in the West Texas desert. On April 8, 2016, SpaceX landed a Falcon 9 rocket on a floating barge in the Atlantic Ocean. And then did it again with a second rocket on May 5, 2016. The rapid fire sequence of progress was derailed on September 1, 2016, when a SpaceX Falcon 9 rocket exploded on the launch pad at Cape Canaveral. The cause was subsequently traced to a change to more dense fuels and an unanticipated situation with solidified frozen oxygen. SpaceX returned the Falcon 9 to service with a successful launch in January, 2017. On March 29, 2017, SpaceX completed an historic first of epic proportions. It became the first company to re-use a first stage booster previously used on an orbital flight. Carrying a satellite for SES meant for service in Latin America, the first stage lifted its cargo into orbit and then returned for a successful landing on the SpaceX recovery barge at sea in the Atlantic. This is the first of several flights planned for 2017 with reused launchers. What’s clear from these rapid-fire headlines is that we have a two-horse race between Blue Origin and SpaceX to create fully reusable rockets capable of lifting cargo, human or otherwise, into orbit. The cadence of milestones is extraordinary and the potential impact on the cost of launching into space could dramatically increase the market for these services. It is starting to look like 2016 was a breakthrough year for rocketry, rivalled only by 2017 for the signature accomplishment of re-using a rocket to launch an orbital cargo for the first time. There is still a long way to go to prove out a fully reusable production rocket that is capable of multiple launches into space, but when you have two upstart companies achieving major milestones that could dramatically reduce costs and open up the space frontier for all of humanity, the bigger mystery is what the large, established aerospace and defense firms in America are doing? Have they started skunkworks efforts to create their own versions of the Falcon and New Shephard? Or are they ceding the future to the upstarts? Do they even believe there’s a big future market in space if launch costs are dramatically reduced? These questions are a puzzle. There is little indication that the large established firms are making any significant effort at a competitive response to build their own reusable rockets. They have announced initiatives to cut the cost on their existing rockets, but this doesn’t get them close to reusability. Some are planning to purchase Blue Origin’s rocket engines once they are built and proven. Still more puzzling, just three of those US-based aerospace and defense firms have spent $50 billion dollars in dividends and share buybacks between them over the last five years from 2010-2015. In effect, the big firms appear to be choosing to return money to their shareholders rather than invest in R&D and build new products for the future. If we have entered a new Space Race to achieve reusability, history will look back and wonder where the big established firms went and why they abdicated the future without a response, why they gave back money instead of investing it in a new frontier. The historians may draw analogies with Apple’s rise to market dominance with the iPhone, completely marginalizing the market leaders of their time – Nokia, Blackberry, and Motorola. If you believe the future market for launch services is much, much bigger as costs come down, then failing to invest in that future looks short-sighted. It is also a loss for America. We need a vibrant, innovative launch market with vigorous competition to drive innovation and reduce costs. Jeff Bezos and Blue Origin announced a new rocket, the New Glenn, in development. It will be one of the largest production rockets ever made, dwarfing all but the Saturn V. It is intended to enter flight in 2020 and will be reusable, potentially bringing down costs significantly and increasing the competitive race between SpaceX and Blue Origin. In September, 2016, Elon Musk, speaking at the International Astronautical Congress in Guadalajara, Mexico, announced a Mars Transport System in development with plans to deliver people to Mars for just $200,000 per person by the late 2020s, a little over 10 years from now. Developments in the private space sector continue to move rapidly. Concurrently, NASA’s Space Launch System (SLS) rocket is also nearing completion. It has been a slower, more torturous process metered by budgetary constraints and a trickle of funding complicated by changing designs and dueling directions from Congress and successive Administrations. Yet the rocket is nearing readiness for testing. The SLS in its initial configuration will be capable of launching payloads of 70 tons into orbit and can scale in later versions up to 130 tons. The cost is considered enormous. NASA is not forthcoming about the real price of each rocket and criticism at the cost (and the obfuscation) comes from a variety of corners. There is an alternative point of view, however. It is expensive because there is no plan to build them in quantity and no vision to use them at scale. Manufacturing costs drop with volume. It is true SpaceX may be able to get to a much cheaper price per kilo, but the SLS is the only tool in our kit that has the potential to lift large structures (at least for now). How large is important. The SLS can not only lift a large payload, but that payload can be as much as 10 meters (nearly 33 feet) in diameter. As a point of comparison, the International Space Station is a structure that is the size of a football field, composed of multiple modules weighing in at a total of roughly 925,000 lbs. It took over a dozen years to assemble via more than two dozen Space Shuttle flights (and a handful of Russian launches) lifting payloads in increments of 7-8 tons per launch. By contrast, the SLS in its largest proposed variant could effectively do the job in just four launches. This capability has some value. Nor are the SLS and SpaceX’s Falcon rockets necessarily direct competitors in the same way that a 737 does not compete with a 747 or an Airbus 380. They have different purposes for different market segments. There are a very small number of Airbus 380 or Boeing 747 aircraft and flights per day in comparison to the 737, but both Jumbos and single-aisle aircraft have viable business models. The problem is that there is no plan that yet takes advantage of these capabilities or that envisions a market large enough for these different systems to co-exist. In fact, the SLS is not even budgeted out beyond the completion of its test flights over the next 5 years. NASA’s SLS is a system in search of a mission (and a budget). SpaceX and Blue Origin are energetic firms in search of a market. What’s clear is that a new era has started, a new space race to achieve reusability with rockets is on. At the end of the day, SpaceX and/or Blue Origin are likely to capture the lion share of launches with their lower cost, but if getting to scale means anything it seems probable that we are also going to need a rocket like the SLS to lift very large cargoes into Near Earth Space as well as smaller cargoes into deep space. In 1996, John Lewis, a professor at the University of Arizona, authored a book, Mining the Sky, describing the enormous wealth of resources that resides in our solar system in the form of asteroids. Lewis wasn’t the first to consider this possibility (Konstantin Tsiolkovsky proposed mining the resources of space as early as 1903), but Lewis provided a compelling vision and backed it with details. He posited the potential to mine these resources and outlined the processes for extracting the resources in them. It makes for interesting reading, but while it suggested potentially vast sums that could be gained in space, it seemed very much on the far horizon of our future and well out of reach. In April 2012, a study group of nearly three dozen experts led by John Brophy, Fred Culick, and Louis Freedman and funded by the Keck Institute for Space Studies (KISS) issued a report with the relatively dry title of Asteroid Retrieval Feasibility Study. What they proposed was revolutionary. Their study detailed out the mechanics and cost of sending a robotic probe to rendezvous with a small asteroid, capture or ensnare it, de-spin it, and then transport it back to a point closer to earth where it could be studied by astronauts. Whether the approach catalyzed a lot activity or the idea of asteroid mining was already in the air, a lot of announcements soon followed. On the NASA front, the Keck approach quickly became a candidate for fulfilling President Obama’s goal of sending astronaut’s to rendezvous with an asteroid. After all, if we can get the asteroid a lot closer, then the mission of visiting with astronauts is also a lot easier. The paper inspired the proposal of a formal mission by NASA called the Asteroid Redirect Mission (ARM) that is in the process of being designed. It has not yet been funded by Congress and is considered controversial in some quarters. Within a few weeks after the study was issued, there were several private sector announcements about mining asteroids that followed in rapid sequence. Two companies have caught the most press. They are Planetary Resources and Deep Space Industries. Both were publicly launched with much fanfare shortly after the Keck study was issued. Planetary Resources is co-founded by Eric Anderson, founder of Space Adventures, and Peter Diamandis of X Prize Foundation fame. The group is backed by some of the most successful entrepreneurs in the world including Larry Page and Eric Schmidt of Google, Richard Branson of Virgin, and James Cameron of Titanic and Avatar movie fame. Planetary Resources is pursuing an approach that involves launching small satellites called Arkyds. The first of them, the Arkyd 100, would essentially be a small telescope used to find more asteroid candidates. That would be followed by the Arkyd 300 series that would be sent out in small groups to rendezvous with an asteroid and survey its size and composition. Deep Space Industries, for its part, has been active as well and will take a similar approach to exploring first, mining second. Its satellites are called Fireflies and Dragonflies. Deep Space Industries will start by sending out relatively inexpensive Fireflies on one-way missions to survey Near-Earth Asteroids followed by a Dragonfly to survey and return a sample back to Earth. Once a suitable target asteroid is identified, a ‘harvester’ would be sent out to pull the candidate asteroid back to a location closer to Earth for mining and processing. The Keck study appears to have been a catalyst for both a NASA mission and two companies that generated a lot of buzz and excitement in the press. It is my belief that at some point in the future this paper will be seen as a landmark turning point in America’s future in space. It comes down to money. A lot of money. In February, 2013, a 150-foot wide Near Earth Asteroid, 2012 DA14, came within 17,200 miles of Earth and inspired a huge amount of speculation on what it was worth. Deep Space Industries publicly suggested it had a value of nearly $200 billion in materials, estimating that the asteroid held $65 billion worth of recoverable water and $130 billion worth of valuable metals. Scientists and economists disputed the composition and the calculation, but the incident served to illustrate that there was a potentially vast amount of resources in asteroids that may be recoverable. To understand the potential, a basic primer on asteroids is worth reviewing. A good deal is known about asteroids from samples of meteorites that have fallen from Earth and from surveys of their spectral reflections which tells a lot about their composition. This allows some educated guesswork, although it is still guesswork. The truth is no one knows exactly what any one asteroid contains or is worth until someone begins mining them. What we do know is very intriguing. We know there are millions of asteroids out there in the main asteroid belt between Mars and Saturn. We also know that there are a large number of what are termed Near Earth Asteroids that are closer or have an orbit that comes close to Earth and may make them easier to access, capture, or mine. There is a good bit of scientific speculation that the bulk of Earth’s water originally came from asteroids. There are three main types of asteroids. C-Type Asteroids are called Carbonaceous Asteroids. They make up an estimated 70% of asteroids and are composed of water, clay, and organic materials. The water content is believed to be in the range of 10-20% for any given asteroid and 6% is made of organic material according to recent surveys. These asteroids don’t have a lot of metals, but water is important. The hydrogen and oxygen contained in an asteroid’s suspended water content can also be used to create rocket fuel. S-Type Asteroids. The S-type asteroids make up an estimated 17% of asteroids and are considered ‘stony.’ They are comprised of silicates (chondrites) that contain 30-100% oxidized iron and achondrites which are made up of silicates and oxides. These asteroids can be mined for oxygen, oxides, and metals. The metals likely include valuable commodities such as gold, platinum and rare earth metals such as rhodium. It’s been speculated that a 10-meter sized S-type asteroid contains as much as 110 lb. of rare metals like gold and platinum. M-Type asteroids are much rarer but contain a lot more metal content. What can be made from an asteroid’s materials? The short answer is a lot. The products that can be produced from these asteroids are endless, but the basic ones are critical. They are: Fuel, water, oxygen, and metals. The organic compounds found in asteroids can also be used to create fertilizers and industrial chemicals, the basic building blocks of most supply chains and production processes. Water, for instance is critically important. It can be used to make fuel, which effectively establishes a space based transportation system. Water also supports life and allows for crews in space to operate with fewer supplies (e.g. water, food, etc.) lifted at enormous cost from Earth. In short, asteroids may hold the key to creating an economic rate of return in space and reducing the cost of operating in space by orders of magnitude. The current cost of lifting a kilogram of material, any material, to a point in space such as Earth-Moon Lagrange 1 is in the range of $100,000. That makes doing virtually anything in space exorbitantly expensive. If, however, we can utilize raw material in space from asteroids, then it potentially makes doing everything in space less costly. Asteroid 1991 DB is a C-type asteroid that is .6 km in diameter and is estimated to contain recoverable quantities of nickel, iron, cobalt, water, nitrogen, hydrogen and ammonia. Asterank calculates the value of this asteroid as $168 billion, with a potential profit of $26.6 billion. Asteroid Nereus is an Xe type asteroid that is .33 km in diameter and is estimated to contain recoverable quantities of nickel, iron, and cobalt. Asterank calculates the value of this asteroid as $4.7 billion with potential profit of $1.4 billion. Asteroid Anteros is an L type asteroid that is 2.3 km in diameter. It is believed to contain magnesium silicate, alumninum, and iron silicate. Asterank calculates the value of this asteroid as an astonishing $5.57 Trillion, with a potential profit margin of $1.25 Trillion. Given that no asteroid has actually been recovered and its composition verified, some of these estimates might be more illustrative than perfect. But with numbers like these being bandied about, it should be clear why there is some buzz in the air among the private space community about the potential for asteroid mining. On the other side of the hype, however, there have been several attempts to dispute the value being placed on asteroids and their recoverable material. When 2012 DA14 did its flyby, economists pointed out that the value of resources in the asteroid were potentially wildly optimistic. You can’t recover those resources by magic. You have to have an infrastructure in place to process what is effectively a big rock into the elements that are valuable, whether water, gold, or anything else. That infrastructure is enormously expensive. It would have to be lifted from the Earth’s surface and would likely cost a $100 billion or more according to some sources. After all, it’s not like you can just land those asteroids on Earth to recover the materials they contain – that’s an approach that didn’t turn out so well for the dinosaurs. Rockets and Rocks. New tools and new opportunities are coming to bear that might change the game of getting to scale in space. Yet to understand the size of the challenge, it is important to know what I mean by scale in space. That is where we turn next. It’s time to talk about what the game really is and why these new developments have the potential to change that game – as well as how much further we have to go. What do I mean by scale? The early NASA plan shared in the previous chapter envisioned several hundred astronauts in space by the early 1990s. Gerard O’Neil, writing in the 1970s envisioned a future in which thousands of space colonies existed around the solar system and we had a true civilization in space. Neither of these visions came to fruition and both are beyond reach today and the reason mostly comes down to a matter of cost. If we want to understand why these visions have not been achieved, we need to understand what they really mean in terms of the cost of getting to scale in space. Here is a simple exercise to illustrate the size of the problem. The modest numbers and ambitions associated with space exploration tend to hide the true extent of the cost problem that constrains any attempt to break-out into near earth space at scale. To understand the issue, start by positing a future presence in space at a notional location like Earth-Moon Lagrange 1 (as noted earlier, this is a location between the Moon and the Earth in which gravity cancels out and where it is theoretically possible to build large structures without using costly fuel to maintain their position. It is used throughout this book as literary tool to illustrate a possible destination in near earth space where future activity may occur but not to advocate that as the only or best location for such activity). Annual support cost for a person living at a Lagrange point. This framework is highly simplistic and does not account for the cost of building a suitable place for said astronaut to live and work, but as a simple baseline, it can be a useful starting point. The reason O’Neill’s original vision of self-sustaining colonies at a Lagrange point never materialized can best be illustrated by a cost table for each of these components. I will attempt to illustrate just two of them – the cost of getting to LEO and the cost of supporting a person living at a Lagrange point. Both scenarios assume no shortcuts and no living off the land, or utilizing resources other than those brought from Earth. This is the upper boundary limit on cost, the most extreme example, yet it is a good tool for understanding the cost of getting to scale and where we are today. Table 1, below, is an estimate of the cost of transporting astronauts to Low Earth Orbit to a station like the International Space Station at various price points and at various levels of scale. We know the cost today (as charged by the Russians) is above $70 million for each astronaut and covers the roundtrip. We also know that NASA is working with the private sector on a Commercial Crew contract to have companies like Boeing and SpaceX transport and return astronauts to the ISS at a lower price. There is some speculation that the US private launch sector can bring down the cost of transport to LEO to a price as low as $20 million per passenger (a number that Elon Musk has promised), although the price may start at something closer to $50 million per passenger. Such a cost reduction is certainly moving in the right direction. However, if you attempt to apply these cost at scale, you begin to see just how enormously expensive it would be to move a large number of people into space. Transporting ten astronauts a year to Low Earth Orbit would cost $700 million at the current list price charged by the Russians, which is pricey, but not unmanageable. But the cost of transporting 100 astronauts is $7 billion (virtually all of NASA’s current budget for human spaceflight). If we were to get so ambitious as to consider putting 1,000 astronauts in space at the current list price, the total cost to just get them to the International Space Station would hit $70 billion and then jumps to $700 billion if we attempted another order of magnitude jump to a total of 10,000 per year. Of course, the Russians would probably offer us a volume discount to spend a vast fortune to benefit their economy, but you get the point. The cost of future private sector launches by US companies may well reduce this price by over 70% to something on the order of $20 million per person (assuming a number that is still speculative). Yet this is a cost that is still prohibitively expensive to put more than a few dozen astronauts in space. For example, launching 500 astronauts to LEO at SpaceX’s breakthrough price point of $20 million per person is still going to cost $10 billion. Going big and launching 10,000 astronauts to LEO at $20 million per person would cost $200 billion, a vast sum, even though it would generate savings of over $500 billion when compared to what we would pay the Russians for a similar volume of passengers to LEO. To make advancing humanity into space at anything resembling scale a real possibility, you would need to reduce the cost from today’s baseline Russian price of $70 million by a factor greater than 99%. The cost of transport to LEO probably needs to be in the range of $250k for any kind of scale to be feasible. At that price, the cost of lifting 10,000 per year is less than $2.5 billion. Expensive, yes, but given what you would get (10,000 people in space), such numbers would fundamentally alter the dialogue of what is possible and politically and economically feasible. It is worth pointing out that we, as yet, have no system in development that would achieve this level of cost reduction (although Blue Origin and SpaceX may well be moving us in this direction). Table 2 lays out a simplified scenario for what it would cost to support various populations of astronaut at a Lagrange point in space. It is based on a budget of just over 5kg/day currently needed to support an astronaut at the International Space Station (e.g. the weight of water, food, oxygen, etc). The Table below assumes all supplies are lifted from the earth’s surface and transported by rocket at an estimated cost of $11,500/kg (an arbitrary estimate). This cost may be much, much lower than what it actually costs today, but it’s a useful starting point for illustration purposes. The results are both eye-catching and show-stopping. Table 2 shows that once again the costs of getting to scale in space are enormous if we are using the current tools available. Supporting just 10 astronauts in space would cost $235 million a year, and this is likely a gross underestimate as noted. But supporting 1,000 would cost $23.5 billion and supporting 10,000 astronauts at L1 would be an unimaginably expensive cost of $234 billion per annum. Again, these numbers – using simple baseline assumptions of the cost of supplying all needs from earth-based launches – are probably on the low side, possibly very low side. But they highlight a fundamental dilemma: We cannot afford a presence in space at anything approaching any definition of scale with these costs. By contrast, Table 3 sketches out a set of illustrative cost reduction scenarios that show the benefit of greatly reducing the cost of supporting an astronaut at a Lagrange point in space. This illustration, like the ones before, is simplistic and does not presuppose how these reductions are to be made. If the cost of supplies can be reduced from the baseline estimate by a factor of 99%, then getting to scale in space begins to look more promising. For example, supporting 10,000 astronauts at a Lagrange point in space would then cost just a few billion, a pittance given the advantage and productive capability such a large workforce in space could potentially bring to bear if it existed. The purpose of these tables and illustrations is not to offer a detailed specification of the costs of launching and sustaining a large scale human presence in space. Real engineers and economists can do a much better job of that. The point is to tangibly highlight the obvious – getting to scale in space with current technology and with the current cost structure is virtually impossible for us to afford. What’s also true is that no serious scenario for building on the space frontier has ever been assumed on the idea that we launch and support a large population in space entirely from Earth. Any serious plan tries to use resources in space for water, fuel, etc. The point of these simple models is to show why these strategies are so critical and how challenging the cost issue is without them. There are great hopes that the private sector may offer a breakthrough in cost on a number of fronts. Musk’s SpaceX is already bringing down launch costs in large chunks and is billed as a hero for doing so. Blue Origin may do the same. There is potential to harness the resources of the asteroids to produce water and materials in space that don’t have to then be lifted from the Earth’s surface (e.g. live off the land in space). There are enormously creative minds working to solve some of these problems. But the simple illustrations above highlight the Achilles heel that high cost has been to every vision of advancing humanity into space in anything beyond small numbers. Effectively without a plan to leverage a wealth of resources that remains tantalizingly just out of reach and that could re-write what is possible for humanity in space (and in general). And that brings us to a discussion about the role of the private sector and the public sector, a debate that may be crucial to truly changing the game in space and potentially getting to scale in the future. We are seeing a surge in private sector activity on the space frontier, a few examples of which were highlighted earlier. The heavy weights getting the most press are companies bringing down launch costs (SpaceX, Blue Origin), proposing colonies on other planets (Mars One), launching microsatellites at a fraction of the cost of established companies and governments (PlanetApp), or proposing to capture and return billions or trillions in value from asteroids (Planetary Resources, Deep Space Industries, et. all). Nor is this a comprehensive list. The future feels like it is being defined by free enterprise. Meanwhile NASA appears adrift, bureaucratic, pulled in different directions and with no political consensus on where to go next and no budget to get there. (The budget situation is so dire that NASA seems afraid to admit how much its SLS rocket will cost in any program for which it is used.) Congress is tight-fisted with funding and getting more so. Commission after commission expounds that our goals in space are being underfunded and plead for just a bit more funding, mostly to no avail. With this as a backdrop, it’s no wonder that a growing chorus is talking up the role of the private sector in leading the space revolution and going where governments have failed to take us. This growing refrain goes on to suggest that if only government would get out of the way and let the private sector work its innovative, breakthrough magic, then costs will drop dramatically and we’ll have a big future in space in a remarkably short time. The conventional wisdom has given up on government leadership or funding at scale. The analogy that gets brought up in serious works by more serious and credentialed authors is the analogy of the Internet. As the story goes, the government helped establish the very basic infrastructure and standards in the 1970s and 1980s with pioneering work by DARPA and others to fund the research. Government then opened up access and allowed the private sector to take the lead, in effect getting out of the way. At that point, economic activity and growth exploded and one of the most vibrant sectors of our economy emerged spontaneously and at enormous speed, producing thousands of companies including behemoths like Google, eBay, Facebook, and more. The Internet analogy suggests we are moving in a similar direction when it comes to space. We should pause at this point to consider the role of analogies. Analogies matter. They provide a construct around which to organize support and a language with which to define the direction we wish to go. They encapsulate and define the strategies we pursue. We need to think about them carefully. When people use the Internet analogy in the space context, they are effectively saying that the private sector is the engine of growth and government needs to both enable and get out of the way, allowing the private sector to do what it does best. If only the government will open up the frontier and allow the private sector and free enterprise to innovate and develop rather than restrain and regulate, we will be able to quickly advance humanity into space. It sounds great. There’s just one problem: It’s probably wrong. I’ll offer an alternative analogy for your consideration: World War II. In my analogy, SpaceX is to the space frontier what Boeing was to the war effort in the second great war to end all wars, a maker of critically important weapon systems in the form of the B-17 and other aircraft. Without a huge number of aircraft like the Flying Fortress, America and its allies could not have won the war. That is clear. Our nation’s industrial might and ability to scale up and deliver the ships, planes, tanks, and sundry munitions and armaments of all types in the vast quantities needed was critical to the eventual victory. It was the private sector led by people with names like Knudsen, Kaiser, and Higgins that built that ‘Arsenal of Democracy’. But looking back at World War II, it would be hard to confuse the role of the private sector and individual industrial companies of the era that produced so many aircraft, ships, tanks, or guns with the overarching role that the government played in mobilizing the public will and resources of America to fight a major conflict. It was government that mobilized the nation and the economy and funded that effort through taxation and financial controls. It was government that set up the procurement process, provided contracts to companies, and issued loans to capitalize the factories and the tools necessary to build the arsenal of weapons that would be needed. It was government that recruited, trained, and fielded the vast armies and deployed the armadas of ships and planes. It was government that set the strategy and drove the war effort. It was government that led, fought, and won the war. When we think of the heroes of that great effort, we think of Roosevelt, Eisenhower, Macarthur, Patton, and others. We think of the President who rallied us and the generals who led the battles and fought the enemy foot-by-foot, mile-by-mile across Europe and the Pacific. Many private sector industrialists contributed enormously to the war effort and their efforts were fundamental to the eventual victory and well known to historians of the era. Without the private sector producing and innovating, the war effort would have been vastly more difficult, expensive, bloody, or lost outright. We would not have gotten the best and most efficient weapons in the huge volumes that were critical to winning the war. You cannot minimize the role of the private sector in creating, innovating, and producing all the weapons and systems needed to defeat our enemies. But truthfully, the effort was so vast in scope and effort, that it would be absurd to think or suggest even retrospectively that the private sector could have won the war faster if government just got out of the way. It was government support and funding via government contracts and loans that enabled the production of the arsenal of democracy in the first place. It was government that fielded the soldiers, sailors, and airmen that used those weapons to fight and win the war. When it comes to analogies, the space frontier may be more like World War II than the Internet. Consider this: The private sector may be better optimized for the shallows of Low Earth Orbit, the lowest price of entry for any kind of significant presence in space. Yet the cost of doing anything significant in space is so extraordinarily expensive that even there the space entrepreneurs keep finding their way back to NASA’s doorstep in search of contracts that will provide actual revenue. These contracts range from carrying cargo to the ISS and eventually passengers to proposals to provide a fuel depot in space for NASA. Unless you’re launching Cubesats, doing anything bigger than a shoebox in space is so enormously expensive that NASA and government contracting remains a key enabling source of revenue. That is as true for SpaceX as it is for the asteroid mining companies. If tens of millions or billions of dollars in investment could be rallied from venture capital, if the investor community were really ready to throw down and invest massive amounts of capital to seize the high frontier, then why does one of the most hyped companies (Planetary Resources) backed by billionaires with vast fortunes use crowdfunding to finance its first satellite telescope with selfies and T-shirts? The cognitive disconnect seems enormous, but it really isn’t. The truth is simple and understanding this paradigm is fundamental: Any real riches in space remain highly speculative, extremely risky, and extraordinarily expensive. Three key words bear repeating. Speculative. Risky. Expensive. What the billionaires and venture capitalists of Silicon Valley are saying if you read between the lines is that companies like Planetary Resources cannot count on a blank check. People are willing to back them with their names, and some limited funding, but no one really knows if pay-off will be in five years, 50, or ever. These companies have to find incremental revenue and define a business model that finances their activity until the day comes when a real return is straight forward, easy, and the infrastructure is in place (largely financed by someone else). At that point the VCs and the wealthy will swoop in to provide the bridge financing needed in exchange for a very high return on investment – and a sweeping claim of credit for their farsightedness and risk taking. Despite the hype and the self-congratulation, the private sector abhors risk. Elon Musk is the exception, not the rule. Venture capitalists are focused on spreading their bets and reducing their risks as much as possible. When new companies are small, speculative, and risky, the venture capital and angel community invests very carefully in very small increments, tightly watched, and closely controlled. They serve as a forcing function to push start-ups to find revenue fast. Venture capital’s interest is to lose as little money as possible. It rarely backs long-term visionary efforts where revenue is a distant and questionable prospect. This is a formula optimized for Silicon Valley and the digital economy. That is why we see Planetary Resources managing the hype cycle with such skill and selling crowdfunding and T-shirts, selfies and school projects to get to a Minimum Viable Product that delivers actual revenue immediately. But when a company becomes a unicorn, valued at a billion or more, with enough momentum to offer ‘proof’ of a market and a business model, the investors stampede to offer tens of millions more. No one wants to miss the pay-off of a sure thing. Anyone who doesn’t understand this dynamic should read a little less Ayn Rand and a lot more Mariana Mazzucato. The private sector, despite the hype, does not (or at least rarely) invest billions on risky adventures without proven markets and a clear path to payback and exit. Very few of these ventures succeed unless they can find significant revenue. Even SpaceX would be a bankrupt and derelict company in Chapter 11 without a few timely contracts from NASA in 2008. When Founder’s Fund, a group of venture capitalists, lament that their industry (venture capital) is not taking enough risk to back very long-term ventures with breakthrough potential, my only response when it comes to the space frontier is: Of course. When that Fund argues that the semiconductor industry was an example of Venture Capital taking on a risky long-term bet in which the long-term outcome of a mass consumer market was highly uncertain, my response is that those investments occurred against the backdrop of a Cold War spending surge in which government was a guaranteed market for innovation. Investments in this industry were far less risky than they are portrayed. The government sector, despite years of being talked down and belittled, is critical to opening up markets on the frontier. Government is the primary enabler of basic science and long-term bets. The problem is that NASA’s budget remains anemic, so both the private sector and the public sector remain frustrated and have lost faith. While there are exciting innovations occurring, the role of public sector leadership and funding at scale is missing from the equation, so we are not making any progress. It’s as if Congress had authorized war after Pearl Harbor, but had limited procurement to 10 planes a year for the foreseeable future. Boeing would have made the B-17 with hopes of selling more (assuming the government provided financing for the factory), but could hardly throttle up the production line and achieve cost savings without a commitment from the War Department to buy in near unlimited quantities. Such a small quantity of B-17s would have meant each one cost an enormous sum and the critics in and outside of government would have leaped on this fact to decry how expensive and irresponsible it is to fight a war using such weapons. On the front lines, the B-17 would have been deployed in limited numbers and would, as a result, have offered no decisive advantage. Each and every loss would have been an expensive disaster creating further restrictions on their use, commission after commission to review what went wrong, and endless criticisms of their viability. The war would have dragged on, ended in stalemate, or been lost to the Axis. With the space frontier, there is no infrastructure in space and no market in place. To build it will likely require mobilizing investment on the scale of $5-$10 trillion dollars. Trillion. Not billion. The private sector will benefit enormously from the contracts and procurement effort that will be needed to advance humanity onto the space frontier at anything like scale. Likewise, a government led effort at scale will need a vibrant and innovative private sector to drive progress, find solutions to critical problems, and deliver results that are cost competitive and continually moving down the cost curve. It will have to be a partnership. The World War II analogy requires a synthesis of government and the private sector working together. It is not a perfect analogy – we are not fighting a war and we do not need to mobilize at anything like that scale and our entrepreneurs will certainly be heroes in this story. I’ve over-rotated by intent. The best analogy is a hybrid of World War II and the Internet in which both the public and private sector have critical, mutually reinforcing roles to play – and with room for heroism on all sides. The private sector will create and field the most effective tools and systems possible (think SpaceX, Planetary Resources, etc.) which will be procured (as goods and services) in large numbers by the public sector. In turn, the public sector must mobilize the vast resources needed to procure at scale and effectively create a sustainable market in space. If building out the space frontier is simply a matter of reducing launch costs and letting the private sector take charge and create a market for services, then perhaps the internet analogy will hold. If you believe a few tens of billions of investment will get us the infrastructure in space to establish an economically self-sustaining foothold, then read no further. But if you believe as I do that building a market in space at scale will require a massive investment from the public sector, then that means we need a viable strategy to explain this both within the space community and to the public at large. It means the hype about the private sector, if not completely wrong, threatens to lead us in the wrong direction. Such a premise forces us to acknowledge a truth – that our politics and policy making has given us no vision around which to rally, no path forward that makes economic and political sense, and are, therefore, incapable of mobilizing resources at scale when it comes to space. This is what needs to change. This is truly an exciting time to watch America’s space program in motion. There is a dynamic new private sector building rockets led by SpaceX, Blue Origin, and more. New companies propose to mine the heavens for the wealth of the asteroids. NASA is preparing to test and field the world’s largest rocket, the Space Launch System, which will give us the capability to launch people and cargo into deep space again for the first time in nearly two generations. But there is also a missing ingredient. Government funding at scale is missing and there is no vision to rally around. Space exploration as a governing vision has significant limitations and has not proven effective in rallying and mobilizing resources. At best, we are limping our way into the future rather than seizing it and leading from the front. A vision is built upon multiple interlocking programs and components. With the next chapter, I will propose an example of a program that blends public investment with private sector innovation to advance humanity into space. We will then close this essay with a vision that attempts to set a broader strategic vision and combine it with an action plan for gaining public and political support to break-out into space at scale.